In recent weeks BBC audiences – and in particular listeners to BBC Radio 4’s ‘Today’ programme – have heard repeated misrepresentation of the chronic problems with utilities and services facing the population of the Gaza Strip. BBC audiences have repeatedly been steered towards the inaccurate view that (as also claimed by Hamas) the economic and humanitarian problems in the Gaza Strip are primarily attributable to Israel’s counter-terrorism measures, while the roles of Hamas and the Palestinian Authority in creating and exacerbating the crisis have been downplayed or airbrushed from the story. The latest chapter in that serial misrepresentation came on January 25th when listeners to BBC Radio 4’s ‘Today’ programme heard an item introduced by presenter Nick Robinson at 47:13 minutes into the broadcast. Simpson refrained from reminding listeners that the 2014 conflict between Israel and Hamas and other Gaza Strip based terror groups began because attacks from the Gaza Strip against Israeli civilians escalated with 52 missiles fired during June 2014 and 237 missiles and dozens of mortars fired in the first week of July – eighty of them on July 7th 2014 alone. The video that Simpson describes as showing “aerial footage from 2014 of Gaza in ruins” does not in fact show “Gaza” as a whole but one specific neighbourhood in which the fighting was particularly fierce because of Hamas’ placement of military assets in civilian residential areas. The ‘investigative report’ to which John Simpson refers was published on December 31st and – while devoid of any empirical evidence – its portrayal of the background to the state of the healthcare system presents an inaccurate picture. “The rest of the 1000 plus word piece follows this pattern of suggesting that Israel is largely to blame for the shortage of vital medicines in Gaza, a shortage that is putting the lives of countless Palestinians at risk. But, this is a lie. The import of antibiotics, and almost all other important medicines, are not in any way impacted by Israel’s blockade. As a CAMERA prompted correction at the NY Times noted, “the import of medicine” to Gaza “is not restricted” by Israel. It’s actually the Ramallah-based Palestinian Authority – and not Israel – that’s responsible for the purchase of medicines for Gaza. But, the PA, as part of the sanctions they imposed on Hamas in 2017 related to their ongoing political dispute, often fails to send such vital drugs to Gaza. The PA-imposed sanctions also includes a major reduction in Gaza’s overall healthcare budget, and a frequent refusal to issue permits to Gaza patients to receive medical treatment in Israel, the West Bank and Arab countries. As the UN Office for the Coordination of Humanitarian Affairs (OCHA) reported earlier in the year, “the escalation in internal Palestinian divisions in March 2017 led to a decline in deliveries from the West Bank and the gradual rise in the percentage of essential medicines at zero stock”. Even the pro-Palestinian NGO Physicians for Human Rights Israel (PHRI) blamed the PA for the shortage of medicine and medical supplies. Following his context-free caricature of ‘militaristic’ Israel and his airbrushing of the fact that the vast majority of those “injured by Israeli forces” were engaged in violent rioting at the time, Simpson tried to create linkage between an alleged epidemic of resistant bacteria and Israeli actions and in order to do so, completely erased the Palestinian Authority and Hamas from his framing. Apparently Radio 4’s “alternative news bulletin” means an alternative to factual, accurate and impartial reporting. You don’t need to be a journalist, Mid-East analyst or expert of any kind to come up with a list of practical steps ‘protesters’ participating in the Hamas organised Great Return March can take to save Palestinian lives. Stop firing at soldiers on the border. Stop throwing grenades and other explosive devices at soldiers on the border. Stop attempting to damage the security fence and infiltrate into Israel in order to kill Jews. We don’t mean to be cheeky, but to introduce a larger point: that the Guardian’s coverage of the region is defined, as much as any other factor, by the denial of Palestinian agency, with reports invariably attributing Gaza’s woes to some sort of act of nature or, much more often, Israeli malevolence. Reports on Palestinian deaths and injuries during the Gaza border riots which have taken place since March 31st are a case in point, with their correspondents at pains to obfuscate Palestinian responsibility for initiating the deadly confrontations with Israeli soldiers. A recent article (Two children among seven people shot dead by Israel, say officials, Sept. 29) by the Guardian’s Jerusalem correspondent, Oliver Holmes, on the most recent border riots, noted an alternative idea for saving lives, one that doesn’t rely our ‘conventional wisdom’. During the past two weeks, the Hamas-led Friday rallies have grown in size and also moved to evenings and night-time, a move protesters say is to save lives as people can move under the cover of darkness. Piles of tyres have also been burnt to obscure the snipers’s vision. 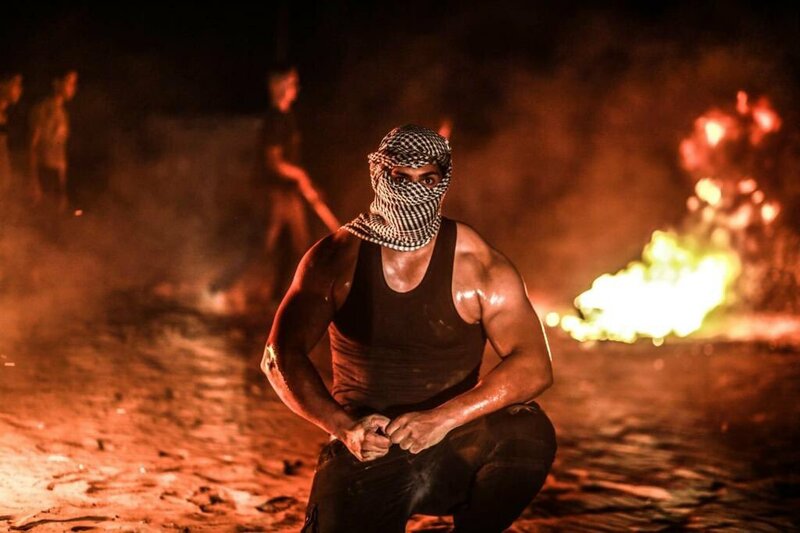 Reports elsewhere note that Palestinians have called this new strategy – which involves the usual riot tactics, such as throwing incendiary devices towards soldiers (and sound bombs that can be heard in nearby Israeli communities), but doing them when it’s dark, “night confusion units”. By “saving lives”, the ‘protester’ of course was referring to the hope that, by operating under the cover of darkness, they could engage in violent actions on the border with greater impunity. However, a report in The National included a quote by a Israeli military official who said “the night protests do not pose a new challenge” given the night vision equipment used by soldiers. So, it seems, despite the Palestinian claim uncritically cited in the Guardian, the new tactic of engaging in violence against soldiers or attempting to infiltrate the border at night will not “save lives”. But, beyond the narrow claim regarding whether such new tactics will save lives, it’s remarkable that reporters like Holmes never seem interested in exploring the more vital questions concerning the impact of a Palestinian culture which encourages civilians – including young children – into situations likely to result in serious injury or death. As former AP Jerusalem correspondent Matti Friedman wrote in his landmark 2014 expose on institutional anti-Israel media bias and the liberal racism of low expectations, “Palestinians are not taken seriously as agents of their own fate.” “The story mandates”, Friedman added, “that they exist as passive victims” of Israel, the only party that matters. This failure of media outlets such as the Guardian to recognize that Palestinians are more than just victims, and have the capacity to resist such destructive behavior, continues to deny news consumers an accurate understanding of the factors driving the Israeli-Palestinian conflict. 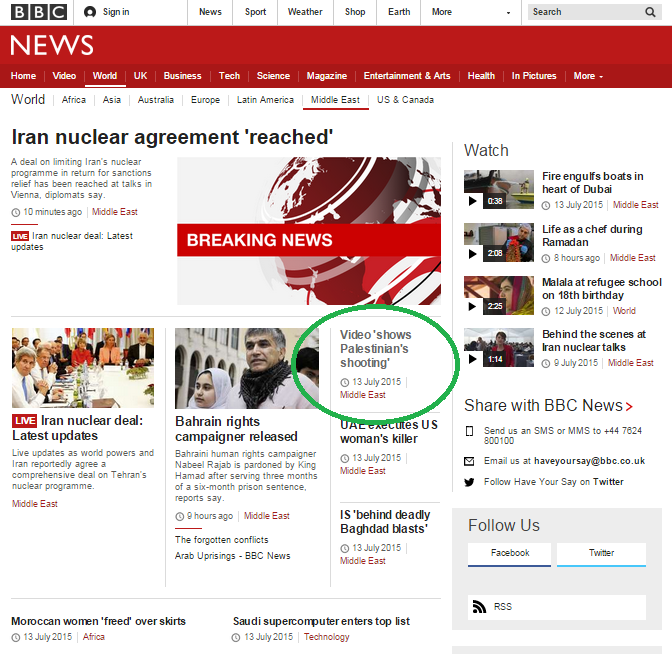 In addition to the items relating to the Balfour Declaration centenary already discussed here (see ‘related articles’ below), on November 2nd the BBC News website’s Middle East page carried an article titled “Balfour Declaration: Theresa May hosts Israeli PM for centenary“. Embedded in that article are two filmed reports by Tom Bateman and Yolande Knell and a link to another article promoting anti-Israel theatricals and amplifying the PA/PLO’s politicised messaging on the Balfour Declaration – all of which also appeared separately on the same webpage. Comparatively little of this article relates to the subject matter described in its headline but almost 30% of its 538 words (not including the insert of analysis from the BBC’s diplomatic correspondent) are devoted to promotion of the PA/PLO chosen narrative (along with references to “their land”) including – once again – a link to an op-ed by Mahmoud Abbas that appeared in the Guardian. However, Palestinian President Mahmoud Abbas said the Balfour Declaration was “not something to be celebrated”. As has been the case in all the recent BBC coverage of the Balfour Declaration centenary, portrayal of the document itself erased from audience view the part safeguarding “the rights and political status enjoyed by Jews in any other country” and no mention was made of the expulsion of ancient Jewish communities from Arab and Muslim lands. “Britain’s pledge, on 2 November 1917, was made in a letter by the then-Foreign Secretary Arthur Balfour to Lord Walter Rothschild, a leader of the British Jewish community. The article failed to adequately clarify that the Mandate for Palestine was issued by the League of Nations and that Britain was selected to administrate that mandate on its behalf. Once again, the fact that the armed forces of five Arab countries invaded Israel the day after independence was declared was airbrushed from the BBC’s account, as was the fact that a considerable number of the Palestinian Arabs who left their homes around that time did so at the advice of Arab leaders. The above-mentioned insert of analysis from Jonathan Marcus encouraged readers to believe that there are two “competing narratives” concerning the Balfour Declaration (while of course ‘impartially’ refraining from discussing their validity) but avoided the topic of the Palestinian Authority’s long-standing politicisation of that document. “Much of the current focus on the Balfour Declaration is due to the fact that it supports the competing narratives of the Israeli government and the Palestinian leadership. For the Israelis it highlights the legitimacy of the Jewish national enterprise, while for Palestinians, it underscores the role of the major powers in helping to create Israel, while – in their view – the legitimate Palestinian aspirations to statehood were ignored or side-lined. As we see from this report and others, BBC coverage of the Balfour Declaration centenary has conformed to a standard formula focusing on unquestioning amplification of PA/PLO messaging while completely erasing the part of the document relating to “the rights and political status enjoyed by Jews in any other country” and the topic of Jewish refugees from Arab lands. Those familiar with the BBC’s record of promoting the recurrent anti-Israel propaganda produced by the anonymous English political activist known as Banksy would not have been in the least bit surprised to find two reports – one written and one filmed – concerning his latest ‘creation’ on the BBC News website’s Middle East page. On November 1st the website published a written report titled “Balfour Declaration: Banksy holds ‘apology’ party for Palestinians” which opens by telling readers that a location that has been under full control of the Palestinian Authority since 1995 is ‘occupied’ by Israel. Readers were also told that the anti-terrorist fence – constructed in order to protect Israeli citizens from Palestinian suicide bombers – is “controversial”. “An actor dressed as Queen Elizabeth II hosted dozens of children at the event. Unsurprisingly, readers were not informed why ‘refugee camps’ (in this case Aida and Dheisheh) still exist over two decades after the PA assumed control of the area. Readers found a statement from the event’s initiator that echoes a mythical quote used by anti-Israel activists which has previously been seen in BBC content. The BBC’s portrayal of the Balfour Declaration erased from audience view the part safeguarding “the rights and political status enjoyed by Jews in any other country”. “The British government’s pledge, on 2 November 1917, was made in a letter by the then Foreign Secretary Arthur Balfour to Lord Walter Rothschild, a leader of the British Jewish community. Readers were inaccurately informed that the League of Nations mandate administered by the British “expired” rather than being terminated by the British government. The fact that the armed forces of five Arab countries invaded Israel the day after independence was declared was airbrushed from the BBC’s account, as was the fact that a considerable number of the Palestinian Arabs who left their homes did so on the advice of Arab leaders. In all, six of the article’s eighteen paragraphs promoted the PLO/PA’s chosen narrative on the subject of the Balfour Declaration. “The Balfour Declaration expressed the British government’s support for a Jewish national home in Palestine, paving the way for Israel’s creation. Readers were not informed that the Palestinians and their Arab patrons rejected the opportunity to have “their own state” on numerous occasions. A further three paragraphs were devoted to uncritical amplification – including a link – of a Guardian op-ed by Mahmoud Abbas and without any clarification on the part of the BBC that, in contrast to Abbas’ implication, the Balfour Declaration referred to “the civil and religious rights” – not political – of “existing non-Jewish communities in Palestine”. “Palestinian Authority President Mahmoud Abbas wrote in the Guardian newspaper on Wednesday that the act of signing the letter was not something that could be changed, but that it was something that could be “made right”. The filmed report on the same story – titled “‘Er… Sorry’: Banksy’s new West Bank work” – appeared on the BBC News website’s Middle East page on November 2nd and once again BBC audiences were told that a location that has been under complete PA control for over two decades is ‘occupied’. The Balfour Declaration of course refers to “a national home for the Jewish people”. The film went on to once again promote the organiser’s use of a theme derived from a mythical quote. Amira is in fact the director of the ‘Popular Struggle Coordination Committee’ and, according to some news reports, he was protesting the event rather than ‘contributing’ to it. Together with Tom Bateman’s filmed report, these two reports brought the number of items giving one-sided amplification to PA/PLO narrative promoting agitprop on the November 2nd edition of the BBC News website’s Middle East page to three. Yesterday’s Al Jazeera investigation focused on a covertly filmed private dinner conversation in London involving a diplomat at the Israeli embassy who was looking for information to “take down” deputy Foreign Minister, Sir Alan Duncan. Though the Israeli ambassador quickly apologised for the comments by the low-level official, Shai Masot, and there was no suggestion of a coordinated Israeli effort to bring down Mr. Duncan, British news outlets immediately pounced, devoting significant coverage to the incident – more coverage, overall, than on the deadly terror attack later that same day. Some of the coverage has addressed the question of why Masot seemed particularly keen on getting information on Duncan, and correctly pointed out his extreme criticism of Israel. Both the Guardian and BBC specifically noted Duncan’s critique of settlements in speeches and interviews made in 2014. An article was published in the BBC website on Jan. 8th titled “Israel’s ambassador sorry over ‘take down’ Sir Alan Duncan comment” which included the following background. Sir Alan, who has described expanding Israeli settlements as a “stain on the face of the globe”, was seen as more of a problem than Foreign Secretary Boris Johnson – who was “basically good”, according to Mr Masot in a transcript of the conversation. Sir Alan launched a scathing attack on Israel in 2014, when MPs backed Palestinian statehood, deeming Israeli settlements as an “act of theft”. “Occupation, annexation, illegality, negligence, complicity – this is a wicked cocktail which brings shame on Israel,” he told BBC Radio 4’s World At One programme. Above all, he simply refuses to accept Israel’s policy in the Middle East is defensible. In a landmark speech in 2014 at the Royal United Services Institute he pushed the anti-settlement policy further than any Tory politician, likening the Israeli attitude towards Palestinians to apartheid in South Africa. He said: “Those that supported settlement policy should be put on a par with racism sexism and xenophobia and antisemitism. Indeed just as we rightly judge someone as unfit for public office if they refuse to recognise Israel, so we should shun anyone who refuses to recognise settlements are illegal. Leaving aside Duncan’s extraordinary demand that anyone who expresses a pro-settlements view is unfit to stand for election, note that, as with the BBC, the Guardian omitted Duncan’s comments about the powerful lobby’s putative control over the US. Tellingly, Duncan’s dog whistle was clearly heard by one particularly prominent antisemitic extremist, who cited his comments as a rare example of a British politician ‘revealing’ the injurious nature of Jewish power. Find information on complaining to the BCC here. Information on complaining to the Guardian is here. You can Tweet the Guardian journalist here. 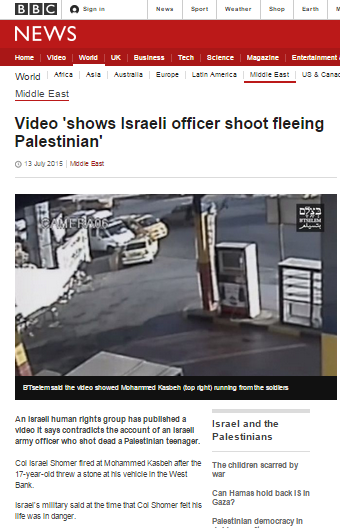 The link leads to a July 13th article similarly titled “Video ‘shows Israeli officer shoot fleeing Palestinian’” which relates to an incident which took place on July 3rd and was not reported by the BBC at the time except for a brief mention in an unrelated article. However, despite those two very clear headline statements, the video in question in fact does not show the shooting of a Palestinian – but only those who bothered to read down to the article’s sixteenth paragraph (out of 22) would discover that. “On Monday, B’Tselem released video footage recorded by a security camera at the petrol station showing the moments before the shooting. “As you can see, the video shows Kasbah hurling rocks at the soldiers’ vehicle, the soldiers giving chase and aiming their weapons, and then the seconds before the Palestinian was actually shot. The soldiers then can be seen returning to their vehicle. We don’t see Shomer firing his weapon, or what Kasbah was doing as he was shot. Clearly those two BBC headlines are inaccurate and misleading. All additional references to the NGO only mention its name and no information whatsoever is provided to readers regarding the organisation’s political agenda and funding. B’Tselem is – as has been noted here in the past – one of the NGOs most frequently promoted and quoted in Israel-related BBC content. Despite that fact, the BBC has yet to provide its audiences with the relevant information concerning that organisation’s background which will enable them to put its extensive ‘contributions’ into perspective and context. One really would think that by now the BBC should have learned to take the serial Israel-related journalistic ‘scoops’ produced by the Al Jazeera-Guardian duo with the appropriate bucket-load of salt. After all, the same partnership was responsible for the publication of the so-called ‘Palestine Papers’ in 2011 and the Al Jazeera employee behind those leaks also engineered the ridiculous ‘Arafat was poisoned’ story in 2013. But no: the BBC has once again swallowed the latest Clayton Swisher creation promoted via Al Jazeera and the Guardian hook, line and sinker, producing its own version of the non-story in the form of an article published on the BBC News website’s Middle East page on February 23rd under the title “Israel PM ‘differed’ with Mossad on Iran, says report“. “Israeli intelligence did not share PM Benjamin Netanyahu’s view that Iran was a year away from making a nuclear bomb, a leaked cable suggests. 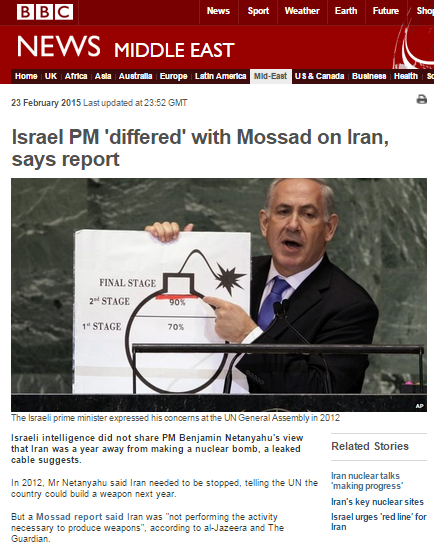 In 2012, Mr Netanyahu said Iran needed to be stopped, telling the UN the country could build a weapon next year. We would not of course expect anything else from the Seumus Milne-Clayton Swisher stable of politically motivated ‘journalism’, but is there actually anything in the leaked cable which backs their claim? As several observers have already noted, the answer to that question is no. The Mossad report doesn’t actually contradict this. For Iran, amassing enough enriched uranium is far more difficult than producing the nuclear [detonation mechanism]….it takes many, many years to enrich uranium for a bomb. That requires thousands of centrifuges spinning in tandem in very big industrial plants. Those Iranian plants are visible and they’re still vulnerable. In contrast, Iran could produce the nuclear detonator…in a lot less time, maybe under a year, maybe only a few months. The detonator can be made in a small workshop the size of a classroom. It may be very difficult to find and target that workshop…So in fact the only way that you can credibly prevent Iran from developing a nuclear weapon, is to prevent Iran from amassing enough enriched uranium for a bomb. Either the BBC did not bother to check out the substance of the Guardian/Al Jazeera story before deciding to replicate it on its own platforms or it has no qualms about playing the role of amplifier for politically motivated ‘scoops’ originating from a media outlet owned and controlled by a terrorism-supporting Middle East dynasty. Perhaps Steve Herrmann would like to tell us which it is.